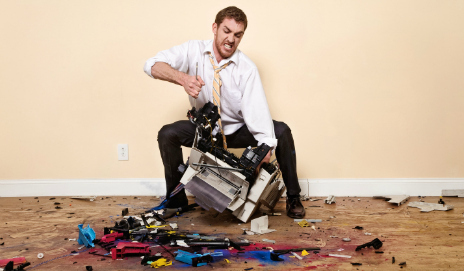 Printer pile-up: are printers the most disposable gadget? When the gremlins set in on your printer it seems easier to just ditch the thing and start again with a new one. But should manufacturers make it easier to fix printers, rather than playing up to this disposable culture? According to responses to our computing reliability survey, more than a third of people don’t bother to get their printer fixed when it develops a problem. That makes printers the most instinctively chuckable computing product in our survey. Around one in five people tried to get their printer repaired to no avail, but for the almost four in ten who didn’t bother, is the cheap purchase price of printers to blame? When a new printer can cost as little as £30, with a set of inks included, it’s probably easier to buy a new one than spend time and possibly more than the cost of a new printer on a repair. Especially if you don’t know what’s wrong with the printer – which one in five didn’t when theirs conked out. Laser printers tend to come with lower capacity starter cartridges in the box and even some inkjet printers do too, so if you’re tempted to buy a new printer for the inks, be careful. But, in the bigger scheme of things, should manufacturers be taking some responsibility for reducing the likelihood of their printers ending up in the bin? Or how about making their ink a more cost-effective option? And more importantly, making their printers easier to fix? Modern ink jets are not worth mending. A waste I know but there we are. My main printer (have three) is an Epson I bought on ebay for £1.47 with no cables. Found some cables for next to nothing and I use cheap after market refilled cartridges. It’s all worked without missing a beat for a couple of years but if it all goes pop tomorrow my investment has been equal in value to a couple of mars bars. Reality is printers are just a vehicle to sell original manufacturers cartridges. Lexmark are the worse, cartridges are very expensive and far fewer aftermarket alternatives are available. Epson on the other hand seem to work just fine with almost any refill.